The hotel features two bars, two restaurants offering both Greek and international cuisine, and 24-hour room service. Guests have the use of the fitness center, equipped with covered swimming pool, the beauty salon, gift shop, business center, and meeting rooms. The Sofitel features 345 soundproofed rooms, 2 Executive Floors, 12 Suites and 1 Presidential Suite. All rooms are outfitted with audible smoke alarms, sprinkler system, dead bolt on the entry doors, with security peephole, and 220/240 V AC. Room amenities include air conditioning; safe box; mini bar; radio; color satellite/cable TV and Pay per view channel; direct-dial telephone with voice mail; and private bath with bathtub, separate shower, hairdryer, make-up/magnifying mirror, radio and telephone. Other facilities and services of the hotel include WI-FI Internet access; ATM Service; Newsstand; safe boxes at Reception; Shoeshine Machine and Florist. Pets are allowed. A very nice feature of the hotel is the fitness center with sauna, indoor swimming pool, hair styling salon, and a range of facial and body treatments in THE SPA. There are 11 modern meeting areas for conventions, seminars, business lunches and social activities, all equipped with cutting-edge, high-tech AV, high-speed Internet and Wi-Fi. The hotel also has a fully equipped Business Center (copier, scanner, PC, fax, Internet, mobile and cordless phones, etc.). 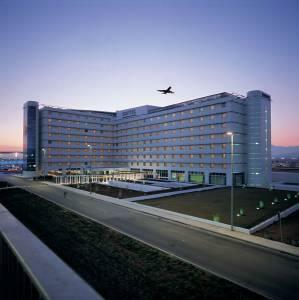 Sofitel is located at the Athens International Airport, just opposite and within a short walking distance from the arrival and departure halls.tanding.